← Marsettes: Mars’ Mid-Century Answer to Rolo! You may not know the name Astor Chocolate but you’ve almost certainly seen their products. They’ll often produce private label chocolate bars for cities and tourist locations – I featured a pair of their lovely Times Square Toys R Us bars back in 2012. 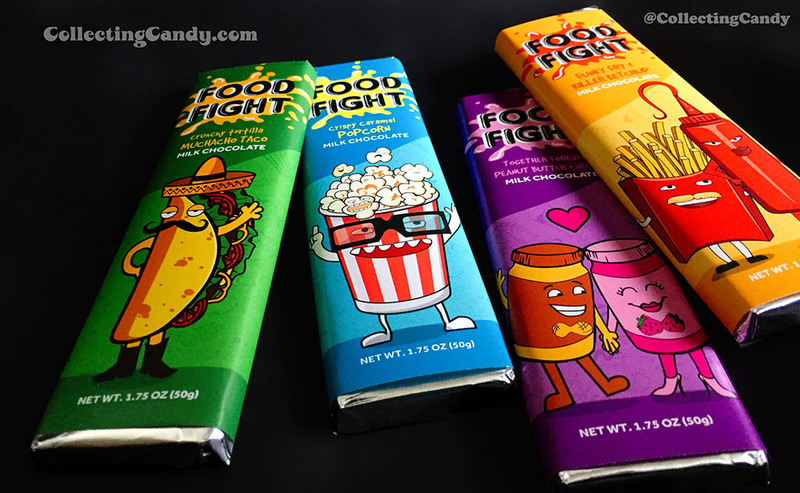 Lately they’ve been partnering up with the FYE retail chain to create some pretty fun offerings but what they’ve come up with now has knocked my socks off; a group of milk chocolate bars featuring crazy flavor combos called Food Fight! 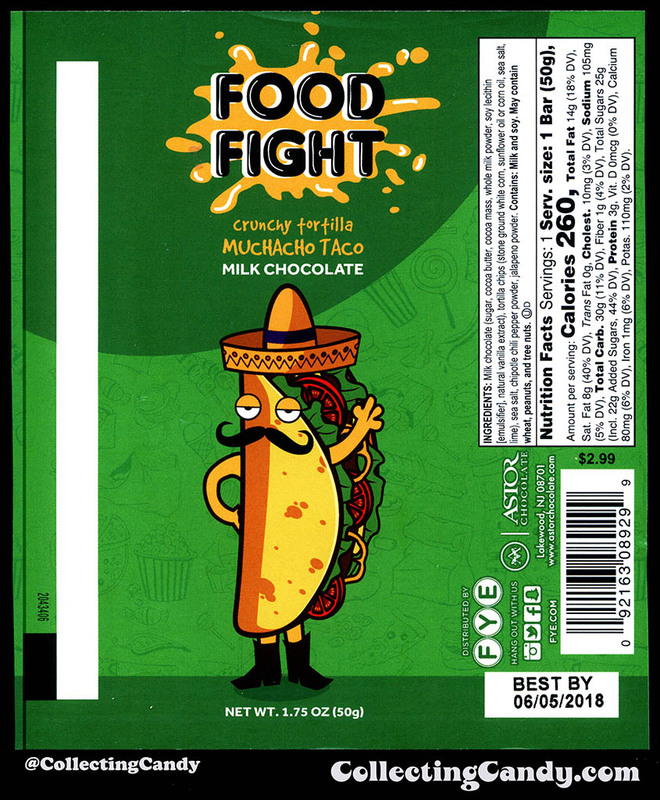 Brand new and arriving on shelves this month, FYE’s exclusive Food Fight lineup includes four different bars in the following flavors: Crispy Caramel Popcorn, Crunchy Tortilla Muchacho Taco, Together Forever Peanut Butter & Jelly, and finally the breakout star (in my opinion) Funky Fry & Killer Ketchup. FYE & Astor Chocolate’s Food Fight milk chocolate bar Summer 2017 lineup. 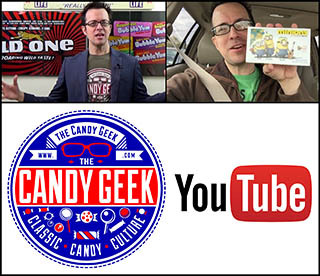 As a candy fan and enthusiast, I’ve tried and lot of different kinds of chocolate bars. These days, manufacturers add all sorts of bold ingredients into their chocolate, creating some pretty stellar and oftentimes unexpected pairings. But I’ve never known any company to try to capture the flavor of french fries and ketchup within a chocolate bar. And somehow, against all reason and expectation, Astor and FYE have succeeded in doing so. All of these bars are pretty tasty, with the spicy Muchacho Taco and crispy Caramel Popcorn edging out PB&Jelly as two of my standout favorites. 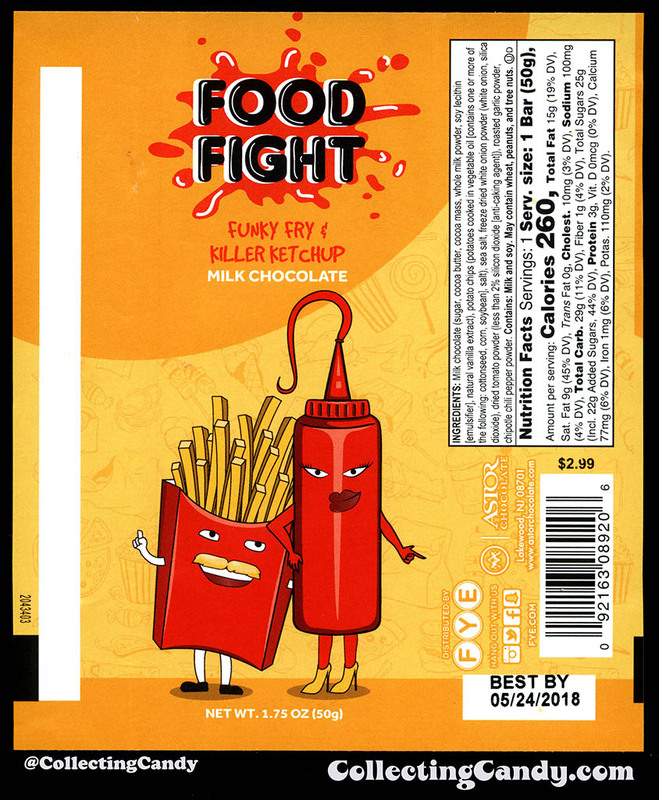 But the experience of the Funky Fry & Killer Ketchup Food Fight bar is one that cannot quite be conveyed with words alone – you have to experience it for yourself. All I can offer is this; imagine infusing McDonald’s french fries into a standard chocolate bar with the tangy kick of ketchup occasionally popping in. An outstanding assortment at launch. 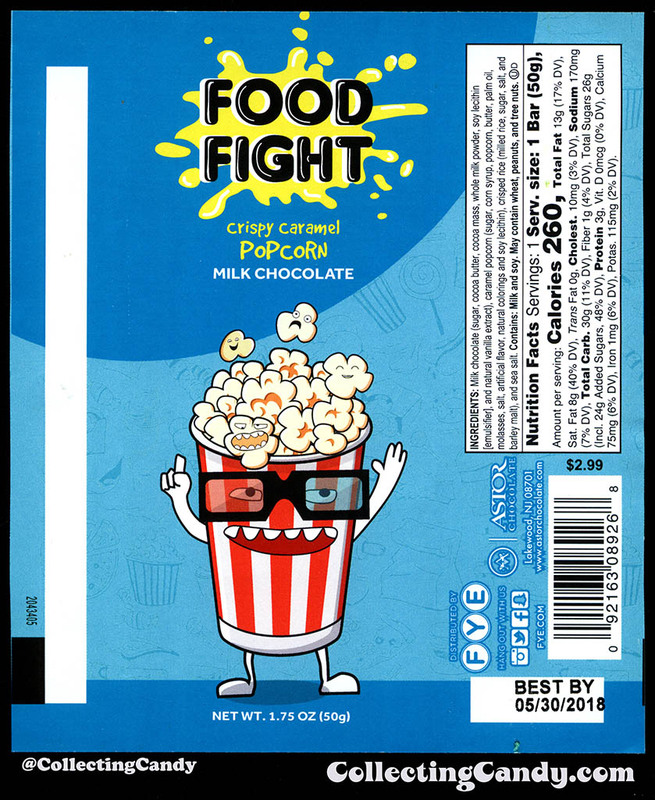 My hope is that these are successful enough for the creative folks behind them to have the opportunity to add more flavors to the Food Fight mix, expanding the lineup and pushing the boundaries even further. It’s the kind of fun crazy offerings (with terrific packaging) I love to see companies bringing to stores. I hope you get a chance to try them. 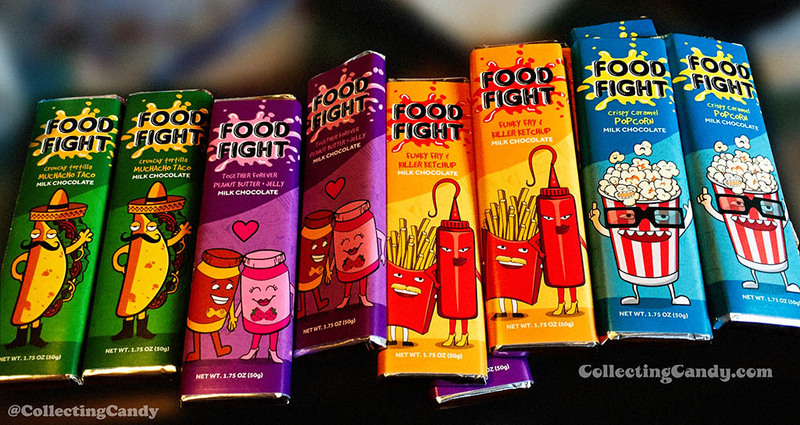 And that’s everything I’ve got on the FYE’s exclusive new Food Fight lineup and the very first chocolate bar I’ve ever encountered that tasted anything like a McDonald’s french fry! See you next time! This entry was posted in Chocolate, Private Label and tagged candy collecting, candy collection, candy collector, candy wrapper collection, candy wrapper collector, collectible, collecting candy, confectionery, confections, mascot, packaging, packaging design, sweets, vintage candy wrappers, wrapper. Bookmark the permalink. 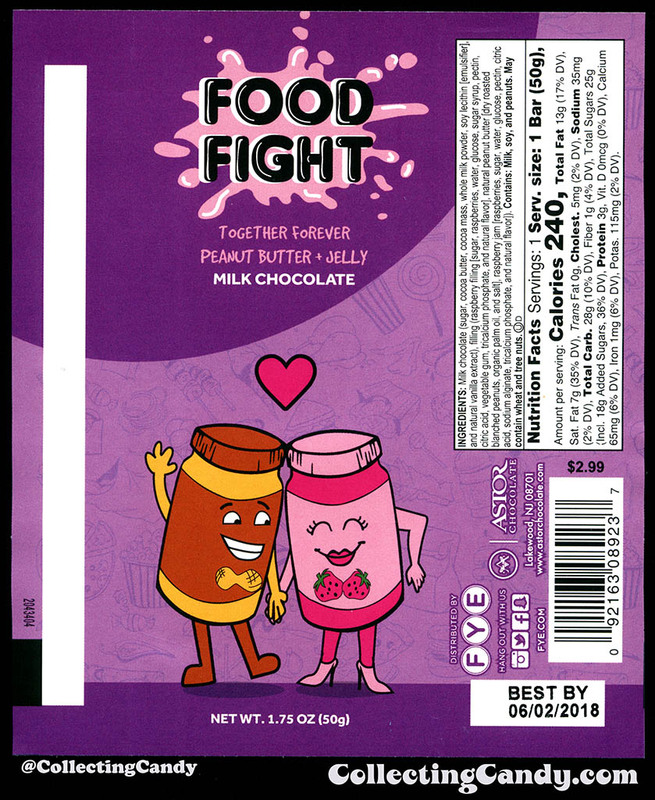 3 Responses to FYE and Astor Chocolate’s Food Fight! – Featuring the first chocolate bar that tastes like a McDonald’s french fry!!! FYE is owned by Trans World, a company that took over the Musicland and Sam Goody chains after Musicland Group went belly up in the mid 2000’s. Very cool! 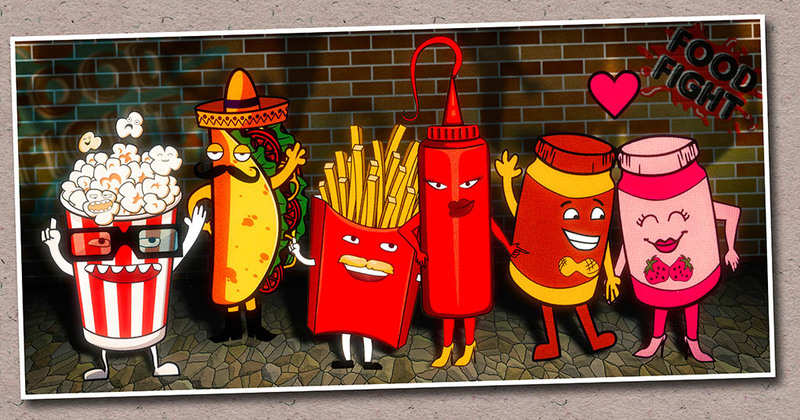 Remember a few years ago when Heinz tried making flavored french fries? I recall they had a chocolate flavored french fry.